Hotel Sayulita Central in Sayulita. Close to everything. Breakfast included. Hotel Sayulita Central is located just one block from the beach and one block from the center of town. Sayulita Central has been remodeled and redecorated. Sayulita Central (formally known as La Casona and Tia Adrianna's) boasts clean and friendly accomodations and a fun vibe to the already funky space. Sayulita Central's rock-themed rooms will have you feeling like a rock star during your stay. Each of the rooms is creatively named after a famous rock group and you will enjoy the accomodation and delightful atmoshphere. A full breakfast is included with your stay; we are one of the only hotels in Sayulita that offers bed and breakfast! Sayulita Central boasts 14 rooms all with private bathrooms. Each room is truly unique. All rooms have comfortable mattresses, pillows and linens. There are ceiling fans to keep you cool and comfortable and balconies providing outdoor seating areas with great views of the town, jungle and ocean. There are plenty of common areas with seating and WIFI access during your stay. The high-ceiling living area provides a comfortable and relaxing atmosphere where you can meet other guests. Sayulita Central's staff is friendly and accommodating and will help you have a wonderful experience while in Sayulita. Pink Floyd Room: Pink Floyd has a queen bed to cuddle up in as well as built-in couches to lounge on and A/C. This room’s private patio is great to watch people pass by on their way to the beach or just to relax in the rockin´ chairs. The sound of the waves will be the best orchestra to take a nap in the terrace before you get ready to enjoy the night life of Sayulita! Rates from $104 USD per night. Queen Room: One of our smallest and coziest rooms in the house! A double bed sits in front of windows that offer the view and breezes from the beach one block away. Although this room does not have a private patio, the romantic and cozy “nest” just outside the room will receive you to take a break during the day. Rates from $93 USD per night. Nirvana OR Eagles Rooms: Great for families or for people taking those extended vacations. This two-in-one room is on the same level as the lobby . You can rent only one or the two rooms. Nirvana has a king and a twin bed for up to 3 guests and Eagles offers two individuals. Each room has his own bathroom. There is no patio or view from this room, but if you´re planning on staying awhile, this is the room for you! Rates from $77 for Nirvana and $93 for The Eagles rates are in USD and are per night. Elvis Presley Room: The Elvis room at Sayulita Central is a small studio with one King bed, this room is located on the lobby level and from there you can watch people in Sayulita roll on by. And it is just a block from the main plaza and a block away from the beach! Rates from $93 USD per night. Deep Purple Room: The funkiest, coolest place in the house. A small hallway leads you to a very private room with a slanted ceiling (watch your head). Windows on two walls allow great air flow into this room that offers a comfortable queen bed. Rates from $93 USD per night. Rolling Stones Room: Nice, big room with a double bed and a private patio with views of town. Rolling Stones also has one of the biggest bathrooms in the house with a beautiful mural tiled in the shower. It´s right off the living lounge, so you could sway in the hammock on your private patio, or relax on the “equipales” in the lounge. Either way is a nice way to enjoy the day if you´re not at the beach. Rates from $110 USD per night. Guns N Roses Room: Next door to Rolling Stone and right off the living lounge. This room is one of the biggest on the property. A double bed sits across from funky vanity with plenty of space in between. 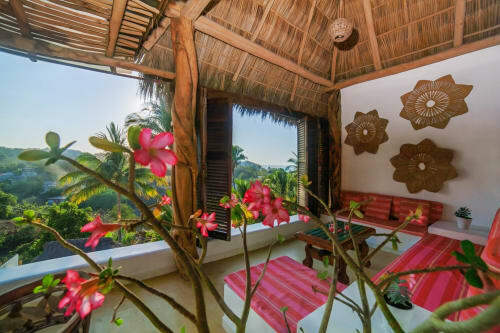 The patio on this room wraps around to give views of the ocean, town and hills surrounding Sayulita. The hammock is the perfect place to read a book or take an afternoon siesta. Rates from $110 USD per night. The Doors: Great for couples or for people taking those extended vacations. This room is on the same level as the lobby . The Doors has a Queen bed and a spacious bathroom.If you´re planning on staying awhile, this is the room for you! Rates from $60 USD per night. Moody Blues: This room is small,cozy and has multiple beds for families or close friends.One Double bed, and two Singles, bunk bed style. On the same floor as the common living room, there is ample space to hang out, and best of all, breakfast every morning right outside your door. Rates from $112 USD per night. The Beatles: Our newest room has its own entrance at the side of the hotel. This unique room is located thee steps above the ground floor and has a terrace for you to sit, have a refreshing beverage or morning coffee, and enjoy the colorful village happenings. With a Queen size bed, private bath, shower, a sitting area with couch, and air conditioning and ceiling fan for your comfort. After a Hard Days Night, this suite is so nice to come home to. Rates from $93 USD per night. For complete pricing details, please refer to the Pricing tab. Prices listed are for two people per room per night. My wife and I enjoyed our stay at Hotel Sayulita Central.....Eduardo and Eduardo were very professional, friendly and polite....also the staff helped make our stay enjoyable....the complimentary breakfast was just how we liked it....the location was perfect. I stayed one night and had the Pink Floyd room. It had a view of the water. Breakfast was great with a home cooked omelette. The head guy there was very charming and helpful. Ernesto I think. Close to everything and a?cute place! Great hotel with amazing staff, can't beat the location! We stayed a night in the El Tri room. It was cozy, clean and comfortable. The A/C worked great and the fan provided enough "white noise" for a good sleep even in the heart of this vibrant village. Love the Rock n' Roll themed rooms at this reasonably priced hotel. The staff is friendly and helpful. Breakfast is included and the ladies are happy to make eggs, ham, bacon, tortillas, etc. any way you like it. Fresh fruit, granola, toast, coffee cake, coffee and juice make for a great start to the day. The beach, shops, restaurants, yoga, you name it is only steps away from this hotel. I would stay here again and recommend to my friends. GREAT REVIEWS TO HELP ME COME TO VISIT! I DON'T HAVE ONE YET BUT AM LOOKING TO VISIT SOON. I WANT TO BE IN THE "MIDDLE" OF THINGS SO I CAN WALK AND EXPLORE. THIS HOTEL SOUNDS LIKE IT WOULD DO THE JOB! FAB! I HAVE BEEN WANTING TO VISIT FOR PROBABLY 10 YEARS NOW! HA! I MAY BE A SOLO TRAVELER SO THIS IS PERFECT. I'M QUIT THE ROCKER-CHICK SO THE THEME IS KICKBUTT! I WANT TO THANK ALL OF THOSE WHO REVIEWED THIS HOTEL. THANK YOU! Great location and amazing staff! Although this is more of a budget hotel, we found our room to be very comfortable and clean. There are no TVs in the rooms, but who needs one when you spend all of your time at the beach. 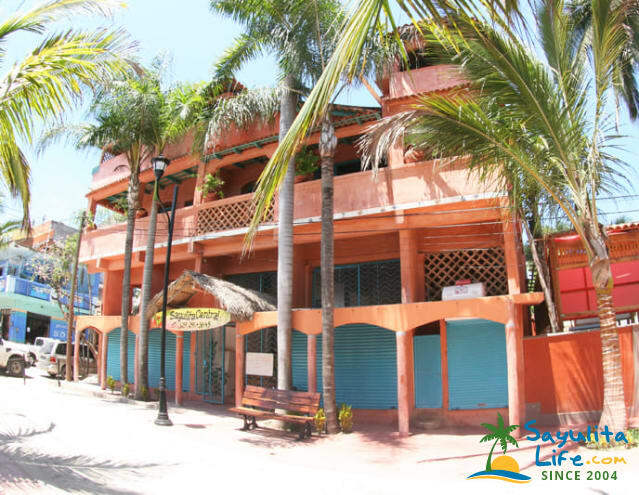 The hotel is both in the centre of town and steps from the main entrance to the beach (right in front of the surf break). It's so close that you don't need to take anything down to the beach, since it's only 30 seconds to run back to the hotel. Conveniently, there is also a store directly across the street to buy drinks and snacks, and the town square is only a block away. Other reviews have said that the hotel can be noisy because it is right downtown, but we did not find that. More importantly, the staff was amazing! They were extremely friendly and accommodating. The daily breakfast was amazing - made to order and served with a smile every day. Eating in the common area was also nice, as it was always clean and there were other interesting guests to chat with. Having spent a lot of time going to/from the beach and hauling our surfboards around, we tracked sand in the hotel countless times but never had a complaint from the staff. They kept the hotel clean and always treated us courteously. 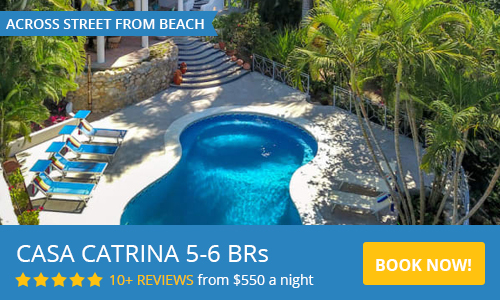 Sayulita is a beautiful and fun place to visit and this hotel is a great place to stay. 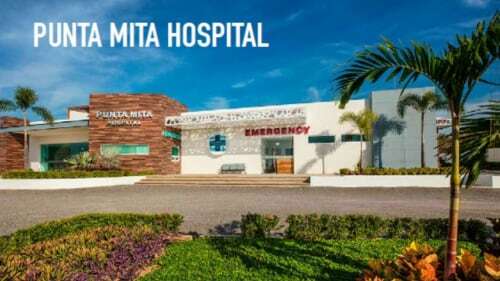 excelente estadía, un lugar que se destaca por su limpieza y excelente personal. La señora de la cocina Maricela hace unos desayunos deliciosos y te pone de buen humor con su sonrisa y sus buenos días. A colourful and warm Sayulita Centro Experience! Our five nights at Hotel Sayulita Central were exactly what we hoped for! As we were budget conscious travellers, we had booked the least costly room, as it faces the street and is near the lobby. They were kind to offer us an upgrade to an upper room for the same cost, which was quieter and had air-conditioning, but lacked a veranda. While we declined, the offer was a great gesture. The room decor is simple. The Rock and Roll theme is really fun. The upper, slightly more costly rooms are bright and a good size, and worth the extra money for views and space. The hotel is quaint and colourful, and the vibe is laid-back, sort of like a Bed & Breakfast or a nicer hostel. It is OK for small families, budget-minded travelers, and those who want to come and go as they please. Street noise should not be underemphasized in Sayulita... it goes from 7am to 1am most of the time, but it is part of the experience of staying in the heart of town! Coming from a noisy city, we didn't care as much. Do be aware of it, and ask which rooms are suitable. Simply put: the heart of town is not for those needing a lot of sleep. Some of are rooms in this hotel do cushion the noise. Breakfast is quite acceptable! Eggs served how you want them, including ham or sausage omelettes (yum! ), bread and some delicious pastries from the local bakery truck, fruit, yogurt, granola, coffee, OJ, and a few teas. The common area is clean and airy. You can have a substantial and relaxing breakfast, and be ready to enjoy the day. Thank you to all the staff at Hotel Sayulita Central! The staff was so nice and helpful. Rooms were fun ans authentic. It is smack in the middle of town. I was traveling alone meeting friends for a wedding in Sayulita when I had a medical emergency halfway into my trip. The staff went out of their way to check on me throughout my stay. That alone was good enough to get my vote but the service overall was incredible. Fresh breakfast made to order in the charming open air kitchen and top notch room cleaning every day. Another guest complaining about lack of AC in the bathroom probably didn’t venture out much as all bathrooms here are rustic and open air by design, even the ones in high end beach houses. The main room AC is very good. I would not hesitate to stay here again. Thanks again Hotel Sayulita Central! *For complete room descriptions, please see above. ALL RATES INCLUDE TAXES AND A HEARTY, HEALTHY BREAKFAST. The organic, when available, breakfast includes local farm eggs, coffee, two fresh juices, pastry from Panino's, ChocoBanana, or our own local French patisserie. Also on the buffet is local organic cheese, sliced meats, yogurt, local honey and fresh, always organic fruit. Served from 8:30AM to 10:00AM daily.